The kitchen is somewhere where I feel pretty comfortable. But grease fires scare the $#!t out of me. One of the first things I ever learned in my high school Home Ec class was how to put out a grease fire. And it’s really something everyone should know, not just hotty hot firefighters. Baking soda is the trick here. You need a lot of it to extinguish big fires, but if you get some of the salty substance on the fire as soon as it starts, you should be fine. Here are some steps to take when encountering a grease fire, which you hopefully will never have to take. 1) Turn off the heat and don’t move the pan around. 3) Douse with baking soda. 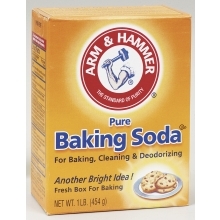 My tip here is to always keep a large container of baking soda near the stove. Just in case. It’s kind of how like moms keep a first aid kit in their purse, complete with advil, midol, antiseptics, burn ointment, bandaids, cortisone, insulin, antihistamines, umbrellas, goulashes, extra underwear …you know, the whole nine yards. They’re always prepared. Anyone here actually encounter a grease fire? did you take the appropriate measures and douse with baking soda or salt?